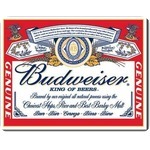 Budweiser logo on a 12 x 16 inch tin metal sign, with 4 holes in each corner for hanging on the wall in the garage or your man's cave. A collector's item for sure. See my store for other BUD and racing items.